In 1896, the composer Edward MacDowell and Marian, his wife, bought a farm in Peterborough, New Hampshire where they spent summers working in peaceful surroundings. There, MacDowell said, he produced more and better music. MacDowell, a founder of the American Academy in Rome, knew that artists from different disciplines enriched each other's artistic life, and he and Marian dreamed of making a community on their property where artists could work in an ideal place in the stimulating company of their peers. In 1906, prominent citizens of his time, among them Grover Cleveland, Andrew Carnegie, and J. Pierpont Morgan, created a fund in his honor. The fund enabled Edward and Marian to carry out their plan. Although MacDowell lived to see the first colonists arrive, he died in 1908. It was under Marian's leadership that most of the 32 artist studios were built. Until her death in 1956, she traveled across the country giving lecture-recitals to raise funds and gain support for the Colony. At its founding the Colony was an experiment for which there was no precedent. It stands now on its record with over 4,000 artists having worked there. Edwin Arlington Robinson was among the first applicants to MacDowell when his work was not known. Over the years others came to work in Peterborough: Milton Avery, James Baldwin, Willa Cather, Jules Feiffer, Frances Fitzgerald, Oscar Hijuelos, Arthur Kopit, Studs Terkel, Barbara Tuchman, and Alice Walker. Aaron Copland composed parts of Appalachian Spring at the Colony; Thorton Wilder wrote Our Town; Virgil Thomson worked on Mother of Us All; Leonard Bernstein completed Mass. 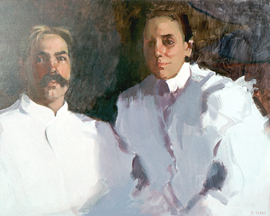 Works of art created by artists while in residence are exhibited in galleries and museums around here and abroad. Colonists have been Pulitzer , National Book Award and Rome Prize winners and Guggenheim, Fulbright and MacArthur Fellows.